As the 2nd season of sailboat cruisin' ends, Rob thought it might be interesting to compare some metrics. Some say that cruising is about "fixing boats in exotic locations". It is true that we are always solving some type of boat problem. Some big some small, some we are prepared for and some we are not. Here is a list of stuff we encountered this season. Popped a fender. The surge in Paradise Village's marina (Nuevo Vallarta) gave our fenders a work out. One couldn't take it any more. Generator. Our Onan 6KW generator was spewing black smoke and was not happy with AC loads over 2KW. After much diagnosis and a trip to the shop to test the injectors, there was nothing obviously wrong. Curiously the more I ran the generator the healthier it got. Over the season we ran a total of 66 hours and we can now pull full power off the generator. I suspect we had a fouled exhaust valve that eventually cleared with more use. This problem ended up not being a problem at all but I spent days and days working on it. Engine Battery volt meter - the volt meter is off. When the alternator is charging at 28.5 volts the meter is reading 32 volts. Easy swap with a new part when we return next season. Perkins exhaust elbow developed a leak - This is a common failure on boats. The mixing elbow is where hot engine exhaust gasses meet cooling salt water in a cast aluminum fitting. After a while the aluminium corrodes until a leak develops. This part lasted 17 years and 2800 engine hours. I made a temporary repair with JB Weld and were able to use the engine, at reduced speed for the last 1 1/2 weeks of the trip. There are many welding resources in La Paz. Update: This exhaust elbow is already fixed and back on the engine. We'll bring a proper replacement down next season. Windlass controls started blowing fuses - after a lot of debug and several 5 amp fuses we tracked down a suspect wire that runs from the control box to the deck switch. Rewired for fix. Two of three 24V engine blowers failed. These two failed within hours of each other. 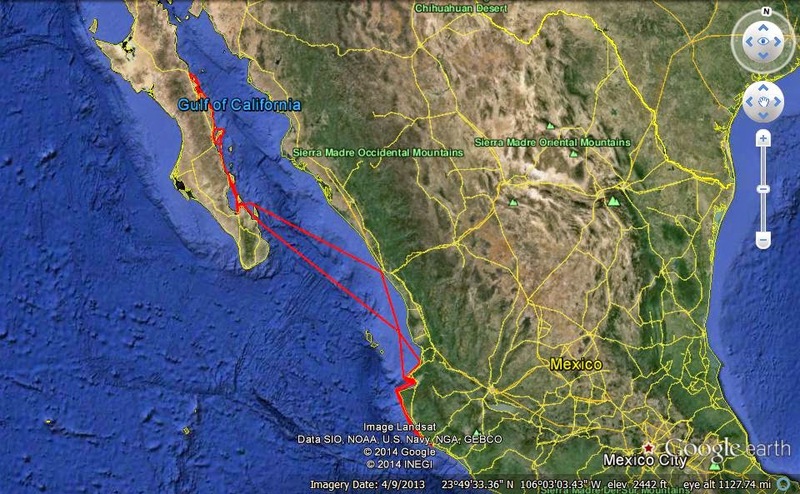 We've had our share of problems and they mostly happened during the second half of our trip in the Sea of Cortez. These things happen and you deal with them as they come. The good news is that there are great resources in Mexico to help with things that are over my head. Additionally, since we are seasonal cruisers, we have the ability to bring down replacement parts from the US every season to keep everything running smooth. This is the bolt that sheared at the top of the mast. You can see that the bearing is rusted. Mixing elbow patch and clamped. This make shift repair lasted until we returned to LaPaz. Here is the repaired part before re installing it.